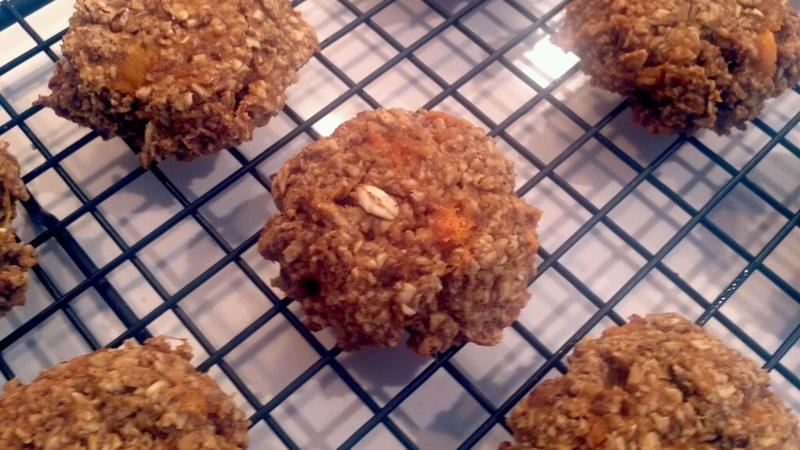 These oatmeal cookies are chewy and mildly sweet. I chose to use a sweet potato for its natural sweetness (so I could cut back on the added sugar), but you could swap it for pumpkin puree and add a little more maple syrup if you prefer. For a gluten free option, be sure to purchase oats labelled Gluten Free, as regular oats can be subject to cross contamination with wheat products. Poke holes in a sweet potato and microwave for 8 to 10 minutes, until tender. Allow to cool. Slice open sweet potato and scoop out flesh (should be about 1 cup) and put into a bowl. Set aside. In a food processor or blender, pour oats and grind into a flour. Pour oat flour into a large mixing bowl. Add baking soda, salt and pumpkin pie spice and mix. Add sweet potato, coconut oil, maple syrup, molasses and egg. Mix until uniform. Spray a baking sheet with Canola spray. Using a 1 tbsp measuring spoon, scoop out batter and place on baking sheet with space between cookies. Using a fork, gently press down on cookies to flatten the surface. Bake for 8 to 10 minutes. Allow to cool.